The meddix is the equivalent of mediss found in oscan inscriptions. All the sabelle and sabellic people used the ancient italic word of meddix, even used by the people next to the Volsci's and believed to be close to the latin term iudex. According to Phaestus, meddix had the same meaning of latin magistratus. It was used by adding to its noun an adjective to better qualify it. The meddix supreme or head of the Samnites was called meddix tuticus (meddiss toutiks) in which the adjective obviously took its name from the "touto". He enjoyed plenary and unlimited power. Differencing from other subordinate magistrates, this chief-in-charge did not need the approval of the council for his decisions yet one would expect that at least one of them would be consulted. Since he was the commander - in chief he was not only in charge of the juridical system but at the same time, especially in the beginning, in charge of the official religion as well. He would call the assembly to order, be in charge of it, and oversee the finances of country. Being the very first magistrate, his office had one year term yet he could have been re-elected several other times in a row. 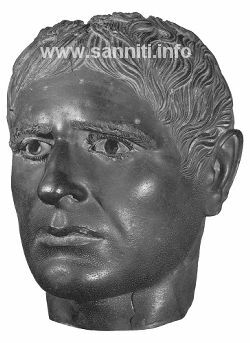 Being the supreme head of state or the Meddix Tuticus, he was equivalent to the roman Consul. Other than having the same high office of the roman counterpart, apparently there was nobody else enjoying the same power or authority. Model of Pegaso from Siena. Capua, end of IV century b.C. concert with the authority of council. Rather different from the Meddix Tuticus, the roman Quaestor did not possess discretionary power. The Quaestor also, same as the Meddix Decentarius, was not the only one in power. Probably he would form a caucus with other councilmen. 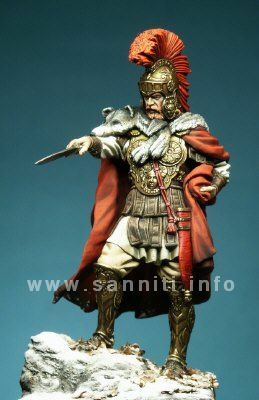 The Meddix Decentarii had the job to oversee the finances of state. The situation was needed when the administrative complexity grew to the point that it could not be effectively discharged by the Meddix Tuticus alone. Similar to the Meddix Decentarius is that of Meddix Aticus. The title of decentarius might simply that its foremost task was to oversee the collection of tithes, whose control seems to be that of the roman Quaestor in charge of collecting pecunia (funds) multaticia romana. Aidilis (aidil in oscan) - Found in Alfedena and Pompeii (whose office was certainly less important than the meddix). 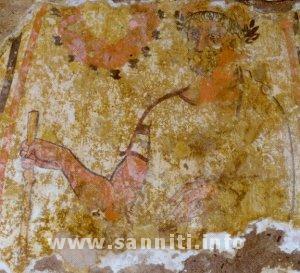 Censor (kenzstur in oscan) - At Pietrabbondante, Histonium, Bantia and Antinum. Legatus (ligat in oscan) - At NoIa and Abella. Praefectus (praefucus in oscan) - At Bantia. Praetor (praetur in oscan) - At Bantia (where clearly his office is being defined as the magistrate previously called meddix tuticus). Promagistratus (prumeddix in oscan) - At Bantia. Quaestor (kvaisstur in oscan) - At Abella, Bantia, Potentia and Vicus Supinus. Quattuorvir (IIII-nerum in oscan) - At Pompei and maybe at Alfedena. Tribunus plebis (tribunus plebis in oscan) - At Bantia. Triumvir (trium nerum in oscan) - At Bantia. It is possible some of these titles, obviously romans', would be attributed in some cases to those originally being solely sabelli's for example like the kvaisturr and ligat that seemed to be involved in jobs not all together linked to roman's influence. In other hands, some jobs indicated by its title's description seem to be directly copied, for instance the oscan's tribunus plebis that did not reflect the same sabelle's characteristics. The most controversial above all was that of the kenzstur, whose title and job requirements were those of the natives, while the romans, instead, being the imitators. The proof of the original word kensztur with the presence of the letter -t- is considered the conclusive element since it is unthinkable that the letter -t- was inserted later into the word censor. had established an official hierarchy with its various degrees of importance defined by a cursum honorum, let us say from the Meddix Decentarius to those of Meddix Tuticus and Kenzstur. Two years were needed to be promoted and to advance to an higher office while five years were required to cover for the second time the same office.